Unless you've been living under a rock lately, you've probably heard about the 26 Acts of Kindness movement started by Ann Curry. After the shootings in Connecticut happened, I felt so terrible and sick to my stomach, especially because I am an elementary school teacher! So, when I found out about the 26 acts, I knew I had to participate! Basically, you have to do one act of kindness in place of each life lost at Sandy Hook. So, 26 in all. Some people are also including the mother of the shooter, which would make it 27. But I don't like odd numbers, so I stopped at 26, haha. 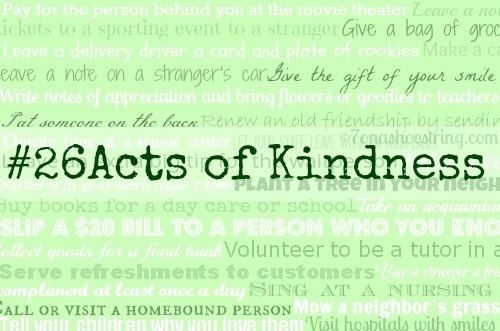 You can find out more about the 26 acts of kindness by clicking HERE! I also found a lot of inspiration on good ol' Instagram by searching #26acts...so many good ideas on there!!! So here are my 26 acts of kindness that I completed from December 20-December 26! 6. Give each student an extra big hug before Christmas break This made me a little sad when so many of them asked me why I wanted a really big hug! Geez kids, can't I just give you a hug?!?! 7. Run one mile for each victim Well, I kinda already did this back in November...but this time, I spread the 26 miles out over a week! 10. Send a Christmas card to our realtor (I mean, she was on it! ), thanking her for our new home! 14. Leave a Target gift card in the store...in the wine section of course! 16. Leave $5 off coupon in Buy Buy Baby Again, never use these!! Hopefully, I will be repayed when I have a little one! 17. Straighten up shelves in the store...I attempted to tackle the leftover Christmas decorations in Target; the OCD in me loved this one! 18. Clean out closet and donate old clothes and shoes I needed to do this so badly anyway! 22. Use my Starbucks gift card that I got for Christmas to pay for a Skinny Peppermint Mocha for me, as well as the next person in line! Their license plate said ONTARIO, so I hope I helped them start their road trip back to Canada on a good note! 25. With all of this driving around, I tried to let other drivers in as much as possible! So there you have it! 26 acts in 6 days...well, almost! Come on, homeless peeps, where you at?! I hope I have inspired you to do 26 acts of kindness! It really was not hard AT ALL and most of the things I did cost little to no money!!! Some things, like leaving comments on blogs, or even leaving random coupons I will never use in stores, are things I want to continue doing!! And if you've received one of these random acts of kindness, don't forget to pay it forward!!! Omg...this was so touching! I was under the rock! Lol I hadn't heard of this so thank you so much for posting! You have definitely inspired me! I started my acts but I have some catching up to do...thanks for some ideas and inspiration!